A Chinese destroyer reportedly warned a U.S. Navy ship it would “suffer consequences” if it did not leave the area during a September encounter in the South China Sea. The U.S. destroyer was in the sea for a freedom of navigation operation to “uphold the rights and freedoms of all states under international law. Decatur sailed within 12 nautical miles of Gaven and Johnson Reefs in the Spratly Islands,” Fox News reported, citing a U.S. defense official. The Chinese warship got dangerously close to the U.S. destroyer in an “unsafe and unprofessional maneuver,” according to a U.S. Pacific Fleet spokesman in October. “In the past, it just had language about ‘you are entering Chinese waters, keep away’ or something like that. This, I think, is the first time we’ve had the idea of ‘suffering consequences.’ So that does seem to be an increased level of intimidation,” Hayton said, according to the SCMP. The Chinese naval vessel reportedly radioed the USS Decatur, saying: “You are on [sic] dangerous course. If you don’t change course your [sic] will suffer consequences,” internal U.S. military records obtained by the South China Morning Post show. A video was also published by the SCMP of the Chinese destroyer coming within 45 yards of the Decatur before the U.S. vessel turned to avoid the collision. British, Japanese and Australian ships all sailed the waters of the South China Sea with similar missions in September. 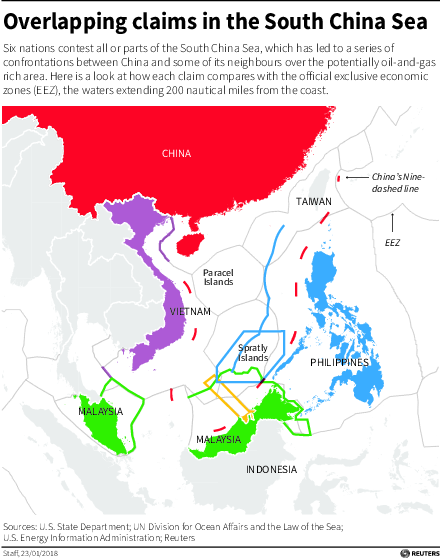 “The US keeps testing our bottom line by sailing within 12 nautical miles [of the Chinese-claimed islands]. So by sailing close to their ship, we show that we are ready,” Ni Lexiong, a professor at Shanghai University of Political Science and Law, told SCMP.